If you perform live, you need a hands-free way to manipulate your audio parameter settings — whether your target parameters live in hardware or software. The solution is the addition of expression pedals and/or footswitches, connected via USB or MIDI. 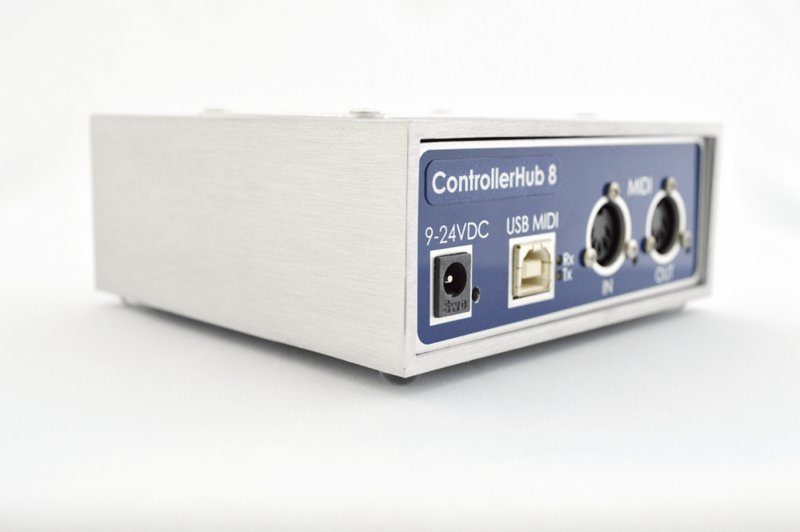 ControllerHub 8 is the central hub for a modular control setup. Connect as many as eight of your favorite expression pedals and/or footswitches, or use multiple ControllerHub 8‘s to connect even more. ControllerHub 8 converts your pedal movements and button presses into MIDI message streams over USB and standard MIDI cables. Within your audio software, click the “Assign” button to map these control movements to your desired target parameters. When controlling hardware devices, simply match the Continuous Controller numbers listed in your device’s MIDI Implementation Chart. The modular approach lets you use the exact number of pedals and buttons you prefer, and locate them wherever you like. Then you can always add “just one more” any time the need arises. 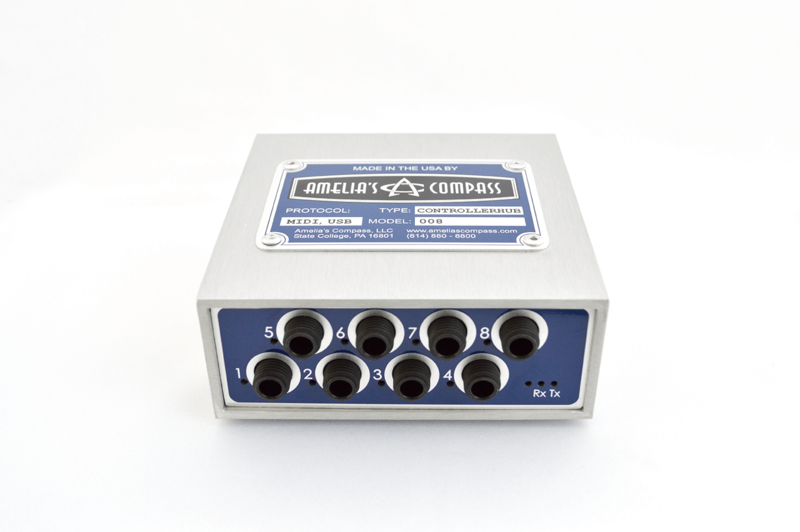 ControllerHub 8 comes out of the box with the first four inputs sending MIDI volume messages (MIDI CC 7) on channels 1 through 4, and the next four inputs sending button press messages (MIDI CC 64) on the same four channels. You can use these default assignments or edit each of the inputs individually to match your custom requirements. Ordinarily, ControllerHub 8 powers through USB, so a wall wart is not included. You need to order this wall wart if: a) you are using 5-pin MIDI only (and not USB), or b) you’ve daisy chained enough ControllerHub 8’s to exceed the power sourcing capacity of your USB host. This varies from host to host. For example, a laptop can generally power more ControllerHub 8’s than a tablet. Please contact us if you are unsure of your power requirements! 8 TRS 1/4” inputs for connection of expression pedals or foot switches. Use 1/4″ TRS cables for expression pedals, or standard guitar cables for foot switches. USB connector for connection to USB hub, or direct connection to laptop or tablet. MIDI connector pair (In, Out) for connection to legacy 5-pin MIDI devices, or for daisy-chaining multiple units. Default internal connectivity is “all-merged-to-all”, but individual merge contributions are switchable. Each input is scanned 6,000 times per second to ensure instantaneous connection between physical control movement and the desired audio result. Phantom-power through USB or MIDI. A wall wart connector is also provided. Wall wart must be 9-24V DC, with power on center conductor. There’s a bit of cleverness employed in the design of the 1/4” input jacks, which allows them to switch-hit between expression pedals and foot switches. You don’t need to decide in advance how many pedals vs. how many buttons you’ll be using. Connect and re-connect however and whenever you like. We use a Xilinx Spartan6 FPGA as the brains of the unit, so it is extremely powerful yet runs very cool and consumes very little power. Three ControllerHub 8’s can be phantom-powered by a laptop’s USB port, and one can even be phantom-powered by a tablet. Every connector has one or more LEDs associated with it, so you know exactly what is happening at all times. We found a source for architectural aluminum extrusions, with 1/8” wall thickness. It is extremely rugged. ControllerHub 8 ships with a perfectly usable configuration, so it can be used right away without editing. Yet ControllerHub 8 is fully customizable to your exact requirements. Each input connector has its own collection of editable parameters, and there is also a global parameter bank. Editing is only needed on the rare occasions when you add, remove, or rearrange the physical pedals or buttons on your pedalboard. It’s essentially a set-it-and-forget-it operation. All of ControllerHub 8’s internal parameters are adjusted using MIDI SysEx messages, so any software or hardware that is capable of sending SysEx commands can be used to edit ControllerHub 8’s parameters. We recommend using Dan Rosenstark’s MIDI Designer app for iOS, as we’ve created an easy-to-use graphical user interface template that runs under MIDI Designer.